The 737-900 is the largest and latest member of the 737 family, and was launched on September 10, 1997 with an order for 10 from Alaska Airlines. A 1.57m (5ft 2in) plug forward of the wing and a 1.07m (3ft 6in) plug rear compared with the -800 increases seating to 177 in two classes (maximum seating is the same as the 737-800's due to emergency exit requirements). 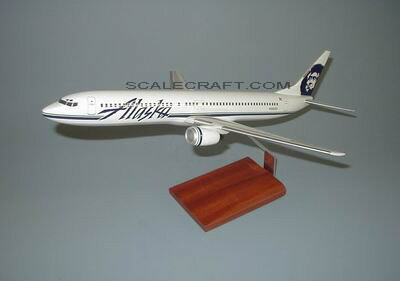 First flight was made August 3, 2000, and the first delivery (to Alaska Airlines) May 15, 2001. Solid Resin. Scale: 1/100. Wingspan 13 3/4 inches, Length 16 3/4 inches.